I've decided to join in with Ginny's Yarn Along series as we head into the summer. I have sort of a love-hate relationship with summer vacation. I know, I know...hear me out, please. I'm not good at relaxed, unstructured time. It just doesn't work well for me; my nature is to seek out projects and to get them done relatively quickly. I'm the kind of person who loves to clean, make beds, organize paperwork and books. I just came home from the small Bears' school, where I was helping the GB's teacher clean the classroom. I was up on a chair, scrubbing the whiteboards with a rag for nearly an hour. I felt a little tingly, I have to tell you. So, knowing myself and my need for structure and predictability, I think having a built-in blogging prompt each week will be a very good thing for me indeed. I'll probably want to keep going after summer ends. As of today, I'm reading Everything I Never Told You, by Celeste Ng. This is a novel about a young girl who goes missing from her suburban Ohio town in 1977. Familial tensions ensue. I'm only a few pages in, having just finished The Last Days of the Romanovs last night. I like the new novel so far, but we'll have to see where it goes. It seems like the plot will be thickening quite a bit. 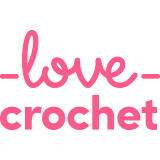 I'm crocheting a small throw for our living room, using a ripple pattern from the blog Meet Me At Mike's. It's an easy design and I like the pointy peaks and valleys it creates. I'm using Stylecraft Special DK for my throw; I'm going with an easy color sequence that requires 16 rows of each color. I like the chunky, graphic look I'm getting this way. So far, the shades I've used are Cream and Camel. I don't really need another throw for the living room, and I don't normally start blankets in the late spring, but I was in the mood for soothing, repetitive crochet and this is perfect. Love the two colours you have chosen so far for the throw, its nice to have a project on the go that you can pick up and down throughout the summer. I love unstructured time! I get nothing done, but I love doing it. But I know people who crave structure as well. The throw is really gorgeous, like caramel and cream. Or a coffee mocha frap at Starbucks! Did you coordinate your throw and the book cover on purpose? Gosh, I wish I were as project oriented as you are! I tried that book, but couldn't get into it. I'm interested to see what you think as you get further into it. sometimes those mindless projects are just the right thing.....I think that's why I've knit the mitered square blanket so many times. :) I certainly know what you mean about structured time, too......even though I'm now 'retired'....I have certain things I do/go to/ volunteer with on certain days. I need that structure even now!!! Your book is on my list...it must be good, it is never in at the library :) Love your throw. Happy knitting! I always loved the summer holidays when my two were at school. Summer term was always so busy and we were all ready for a bit of down time without anything scheduled after everything in the lead up to summer being so hectic. 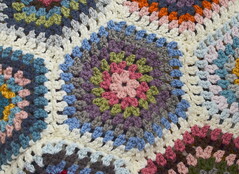 The blanket's looking lovely, I often start projects I don't need, the mood just takes over. That might be the cutest crocheted throw I've ever seen. I love the color and the pattern!! I love the blanket colours and will be beautiful when you finish. Thanks for the link to the ripple pattern. It is very clear and detailed, just what I need! Another beautiful blanket reminding of the shades of sand. So summery and fresh feeling... and so lucky to finally slow down and unwind carefree and leisurely! Crochet or knitting or embroidery and reading sounds a good way to pass the summer months to me. You don't need to apologise for needing a structure to your day. I think we all need structure to our day to thrive and grow. I was reading about your city in the guardian newspaper (I'm one of those dinosaurs who still reads a broadsheet everyday) and the plan to build a new development for 100,000 people. The politics are interesting, not just for New Mexico but for the world: where are we going to build fully sustainable communities to house our growing population? Your throw is looking really well so far. You have to NEED another one to start making one! The blanket is looking so nice! A sort of a beachy (or maybe in your case "desert") look to it, so perfect for chilly summer evenings. I never read books of missing kids, I just can't enjoy them now that I have my own kids. I hope you enjoy your summer. I too like routine and a course of action, but often it all falls apart and I end up flying by the seat of my pants! The Yarn Along sounds like a great idea! For one brief second I considered joining in, then realized that my entries would be rather dull since most of my reading is done on a Kindle. There would be no enticing pictures of books to include. I'll enjoy watching you participate as the summer progresses. I am the opposite Jennifer...I love unstructured time! We are still 5 weeks from the school summer holidays here. 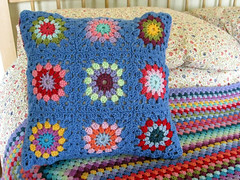 I like the look of your ripple blanket and the large rows of colour will be beautiful. I do very well if I have unstructured time, I just never seem to have any! The new book you are reading is really fascinating. I finished it earlier this year, I look forward to hearing what you think about it. I love unstructured time. I feel like any thing is possible if I do not have any deadlines or restraints. Funny how people are so very different. This weekly reveal of what people are reading and making is so fun. I look forward to hearing how you like the book and seeing the blanket grow. Being a teacher, I love the unstructured time!! Love your colours. I like elderflower cordial with sparkling mineral water but it's also very good with English sparkling wine. Quiche and home grown salad leaves is a favourite summer staple here. I made salmon and watercress tart this week. Once the pastry is made and cooling in the fridge I think dinner is almost there. Wishing you a.very happy anniversary and a relaxing start to the holidays.